MK1 Astra Owners Club :: View topic - HELP needed for my Astra 1.3S EXP! HELP needed for my Astra 1.3S EXP! Posted: Sun Sep 10, 2017 12:44 am Post subject: HELP needed for my Astra 1.3S EXP! I am to any members who can help with the rear hatch decals / writing / text on my EXP I'm restoring. Unfortunately I’ve been let down big time by the guy I’d given my Astra EXP to be restored / resprayed. It was all going fine until he fell out with the owner of the garage he was sharing. The Astra is almost done but the gold band wasn’t the right shade and needed to be re-done. We had trouble trying to find the right code and because it had been sprayed sometime in it’s past it’s difficult to know the exact shade of gold it should be. Any ideas on the correct paint code for the gold? To cut a long story short, the car has been stuck in the garage since November last year with nothing happening. I’ve paid the money in full (big mistake) so it looks like I need to pay someone else to finish off the car. 1) Could you take a photo of the gold ‘ASTRA 1.3S’ text and put a tape measure from the left side of the hatch so I can read off the distance to the start of the writing and the end of the writing. Could you do the same with tape and measure and photograph the height of the writing. 2) Could you do the same with the gold ‘VAUXHALL’ text and put a tape measure from the right side of the hatch so I can read off the distance to the start of the writing and the end of the writing. 3) Could you also take a photo of the black ‘EXP’ text and put a tape measure from the right side of the hatch so I can read off the distance to the start of the writing and the end of the writing. 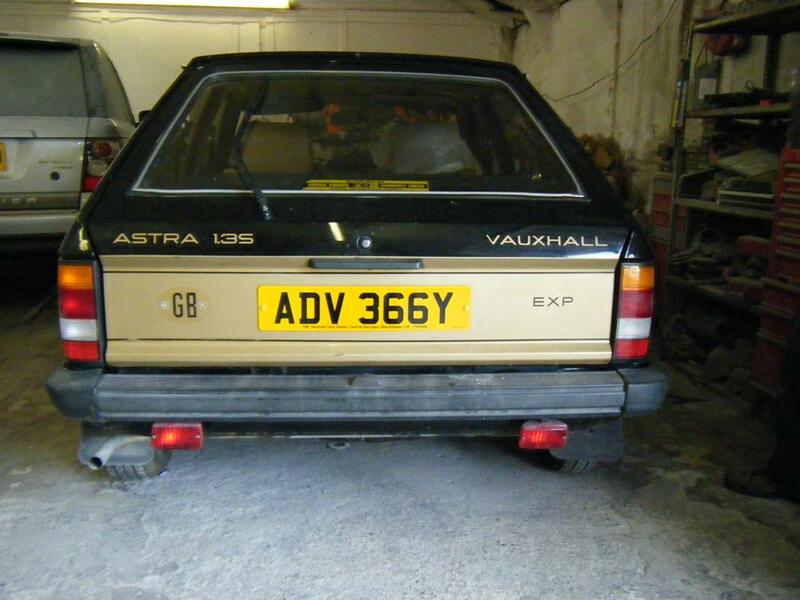 4) Is the antique gold used on the Astra EXP the same as that used on the standard Astra’s and Cavalier’s of the period? Thankfully, because I replaced both front wings I still have them for reference for the side stripes.